Recently, I became on online ESL Teacher with Say ABC and I absolutely love it! Not only do I get to teach the cutest kids ever, but I can also teach from wherever I want! The pay is awesome, the flexibility is incredible and it’s honestly the best job I’ve ever had. So what do you need to do to get a job with Say ABC? Let me help you out and explain further why I love teaching for Say ABC. Don’t Feel Like Reading? Watch this Video about the Say ABC Application Process! 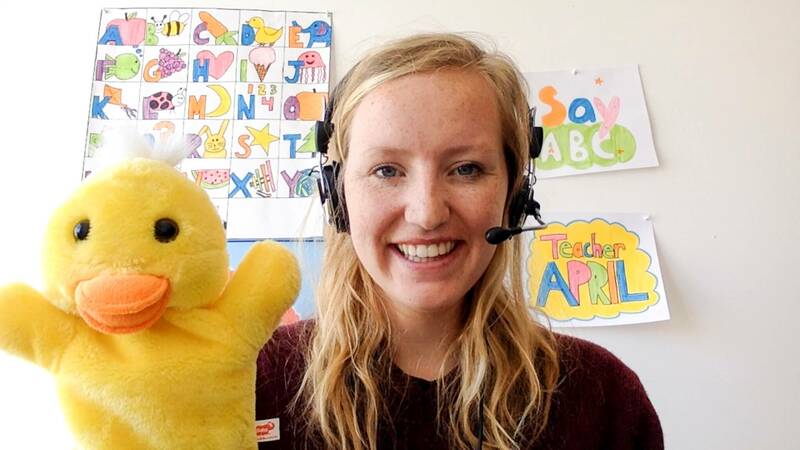 Why Teach with Say ABC? What Happens During the Interview? There are four main reasons why I love working with SayABC and why I think you will too. Here they are below. The base pay for each 40 minute class is $15USD, but there are added incentives so you can often end up making around $21USD. Plus a big bonus if you refer someone who gets hired. You get to choose your own hours and make your own schedule! You just have to make sure to notice the time difference between where you live and Beijing time. There are four classes per day that you can sign up for. On Saturday and Sunday mornings Beijing time there are an extra two classes you can sign up for. Since I live in Mexico City, these classes are actually on Friday and Saturday evenings for me. You get to teach English as a Second Language to really wonderful kids in China so the job is super fun. You get to work from home or wherever! This means you can work while traveling and really work from wherever you are in the world as long as you have a good internet connection. You must be a native English speaker. Have a fast and reliable Internet connection and a computer with audio and video capabilities. You must have a Bachelor’s Degree or equivalent in any field. This is due to a new law in China. The website says you need a minimum of 1 year’s teaching experience. HOWEVER I got the job with only a few months of teaching experience because I have a Bachelor’s degree and a TESOL Certificate. You’ll never know if you don’t apply. It is highly preferred that you have a TESOL or TEFL Certificate before you apply. You can get a TESOL or TEFL Certificate on a number of online courses. I took my TESOL Certificate through Coursera and Arizona State University. However, I have heard good things about TESOL and TEFL Certificates offered on Groupon as well. The Groupon ones are quite a bit cheaper and can be finished more quickly. I would highly recommend getting a TESOL or TEFL Certificate ESPECIALLY if you do not have teaching experience as this will give you a higher chance of getting the job. SayABC has a four step application process that I have outlined below. If you read on, you will see tips on how to pass each section of the process and information on what to expect as well. The first step is to fill in your application which is very straightforward. Just go to this SayABC website link and fill out all your experience and relevant information. Make sure that when they ask you how you heard about Say ABC that you click on ‘Referral’ and type in my code, EHE6B5, unless someone else has referred you. This will show SayABC that you have been referred by me (April Thompson) and I will get a little commission for you becoming a teacher. Plus if you need any further help with your application process, just comment on this post or send me an email at justleavingfootprints@gmail.com and I’d be happy to help you out. This is a slide that comes up at the begginning of every lesson with SayABC. You will know within two business days if you have passed your application. If you pass your application, the second thing you need to do is sign up for an interview. There are two ways you can do the interview, you can pre-record yourself on the Say ABC platform or you can do a live interview with someone over the computer. I would highly suggest investing in a good pair of headphones (or using ones you already have) for the interview as one of the class rules is that students need to wear headphones as well. Remember that when you sign up for the interview you need to take into consideration the time difference between where you live and Beijing time. On the Say ABC platform, your interview time will likely be displayed in YOUR time, but when they email you it will most likely be displayed in Beijing time so keep that in mind. Your interview will consist of you answering some simple questions like when you can start working, what your strengths and weaknesses are and why you want to be a teacher with Say ABC. Next you will be doing a class demonstration. This means you will be pretending to teach students. If you do the pre-recorded interview, you will be pretending to teach a student that isn’t actually there. If you do the live interview, you will be ¨teaching¨ your interviewer and they will act like they are a child who is just beginning to learn English. This is a typical slide from Level 1 Unit 1 Lesson 1. Now, don’t freak out if you’re not sure how to prepare. Say ABC will send you the class slides beforehand and you will need to choose a level that you want to teach during your interview. Say ABC has five levels of students, Level 0, 1, 2, 3 and 4 (although no kids have actually reached Level 4 yet because SayABC is a relatively new program). Anyways, you will essentially ‘teach’ the level of your choice for 15 minutes. I’ll be sure to add a video and maybe a blog post about tips on passing your interview soon as well, but just remember to use super simple language (as little talking as possible to get points across). Make sure you also use TPR. This means Total Physical Response, so do lots of actions so students understand the words you’re saying. Also be sure to include some props! These can be puppets, pictures or anything really that has to do with your lesson. Me with my duck prop and a kid-friendly background. One more quick tip on your interview is to make sure you have either a clean background or a kid friendly background. I made some posters before my interview and I think they really helped me to land the job. Plus, be sure to include a print out or a drawing of the Say ABC logo too as it shows you really want to work not just as an online ESL teacher, but as a Say ABC ESL teacher! My mentor was very impressed with my background and I have a feeling that the more kid friendly your background is, the more likely you will pass the interview. You will know in two business days if you pass your interview. If you pass the interview CONGRATS! The next step is to do the training modules on the Say ABC platform. These modules contain videos and quizzes that will help you learn how to better use the SayABC platform. You will also get to book a live mentor session at this step. This means you will meet on the Say ABC platform at the time that you choose and talk with your mentor. Your mentor will be able to answer any questions you have and help you get ready for your evaluation class which is the final step in the application process. You will likely have to demo a few slides for your mentor as well so they can give constructive feedback on what you need to improve for your evaluation class and what you’re already doing really well. You will know in two business days if you pass your mentor session. Don’t freak out about the evaluation class too much okay? If you don’t pass it the first time, you will actually get a second evaluation class or a second chance to get the job. If you don’t pass the first time, they will give you feedback on what you need to improve for the second class. Ok so what is the evaluation class? The evaluation class is where you get to teach ACTUAL students so the Say ABC staff can see how well you do in a real classroom setting. You will be teaching between 1 – 4 students as all of Say ABC’s classes consist of up to four students at a time. Again, you will get the class slides ahead of time so you can prepare. Remember this class is 40 minutes long, so try to stay on track of time. If you end a few minutes late that’s totally okay but do not end too early! If you reach the end of the slides early, simply go back to a more complicated slide or two and have the students do it again so they can remember everything better (and so you don’t end too early). April is the founder and main author for Just Leaving Footprints. She has written for numerous blogs and publications such as Explore Magazine and Snow Pak. April loves writing about sustainable tourism, and promoting other sustainable travelers on her Facebook Group and Instagram Community, Ladies for Sustainable Travel. Currently, April is living and teaching English in Mexico City with her husband Arturo and they don’t plan on stopping their travels anytime soon. Hi there! Welcome to my little corner of the internet! My name is April and I'm a huge travel junkie. However, I am also a big tree hugger and so I try to travel and live as sustainably as possible. When I'm not traveling or geeking out over plastic free products, I am likely doing yoga, getting lost in a good book, hiking or overdosing on matcha lattes.